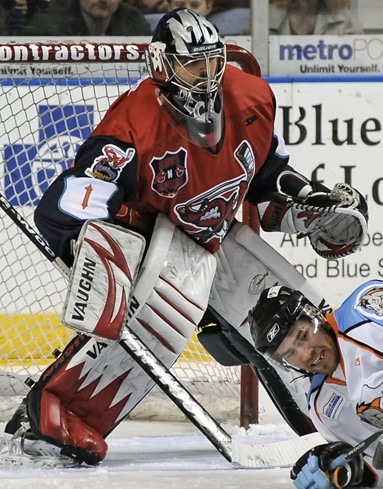 The minor league jersey news just keeps coming, this time out of the AHL. 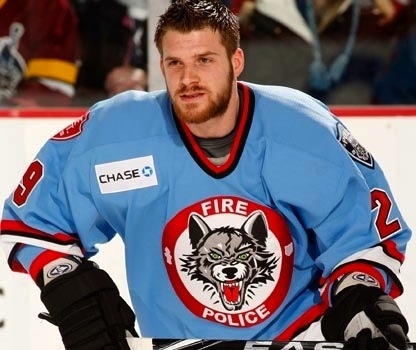 The Chicago Wolves honored their everyday heroes on Saturday night with special Police & Fire Forces jerseys, which feature special shields on the shoulders. Peter Mannino #33And yes, they're the same powder blue color that's been sweeping the NHL. It started with the Pittsburgh Penguins recapturing their youth, wearing their original colors at the Winter Classic in 2008, then later as an alternate sweater. Then the Panthers hopped on the bandwagon this season adding the hue to their new third jersey. A couple of pictures of the jerseys in action were available on the Wolves' web site so I grabbed them to share with you. I don't think they look awful, but I do think the red is too bright. You've got a really bright blue jersey so your accent color should be muted a bit — or at least that's my two cents. But that's what you get designing a jersey in-house. Brett Sterling #29I might've gone with something closer to the Wolves' own brand of maroon instead of that bright red. But then again it is fire engine red, so maybe I'm out of line. This shot of Brett Sterling offers an even better look at the sweater. You can even click to enlarge it slightly. The jerseys must have brought Chicago good luck because they beat the Peoria Rivermen 3-2 in a shootout before a record crowd on January 2. Chris Chelios #7They're probably hoping for more luck as this won't be the last the Wolves will wear these sweaters. They'll be used on three more occasions this month before being auctioned off for charity. Fans will see them next on January 9, 10 and 17 — all home games. You can read the full release on the Wolves' web site. By the way, how weird is it that Chris Chelios is playing in the minors? I guess I just thought he retired, but it turns out he declined an NHL offer just last month to keep playing for the Wolves. The guy's pushing 50 and he's just doing what he loves. No pressure, just having fun. Before I go, I will leave you with this photo of the new powder blue jerseys hanging on the rack — straight from the aforementioned release. Thanks to Reilly for passing along the info! How I do love the minors. 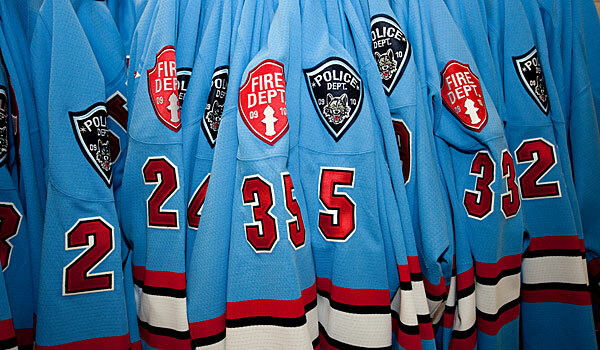 Daniel writes in with a quick note regarding his Bossier-Shreveport Mudbugs who also paid tribute to their local cops and firefighters this past weekend. Join us Saturday, January 2 for "Guns N Hoses Night" as the Mudbugs play their first home game of 2010. Guns N Hoses Night is when we recognize law enforcement officers and firefighters from all over the Ark-La-Tex with a special night themed around their service. The game will even feature a tug-o-war between police and firefighters at intermission, and the 'Bugs will wear specialty jerseys that will be auctioned off to the fans after the game. Not that any fan would necessarily want to own one. But a good cause is a good cause. And a tug-o-war was involved. That's what I really want to see pictures of. In theory, the firemen should be the easy victors. Anyway, you can see more photos of this special sweater in action by clicking here. Thanks again to Daniel for the link.